Our Recon Tanto continues to redefine the standard for combat knives around the globe. Having seen active military application in numerous conflicts over the last 20 years, it is well on its way to becoming the preferred fixed blade for special military units and even SWAT teams on our own soil. Experience the extraordinary quality - test the distinctive razor-sharp edge for yourself and you will see why the Recon Tanto is a knife you can’t afford to be without! Also available in SK-5 and 3V. There isn’t a person working in the knife industry today that knows more about the Tanto than Cold Steel does. It was, after all, Cold Steel who invented and popularized this knife style in the early 1980’s. We have spent millions of dollars persuading the public, both through advertising and live or videotaped demonstrations, of the Tanto’s many advantages. We have been producing Tanto’s for more than 30 years now, and there is still no factory or custom knifemaker around making a Tanto that can approach the cutting, slashing or piercing power of one that is manufactured by Cold Steel. All of our Tantos feature a deep lustrous satin finish on the hollow ground blade bevels and a contrasting line grain finish on the blade flats. This technique highlights our state of the art grinding methods and emphasizes the Cold Steel Tanto’s unique appearance. 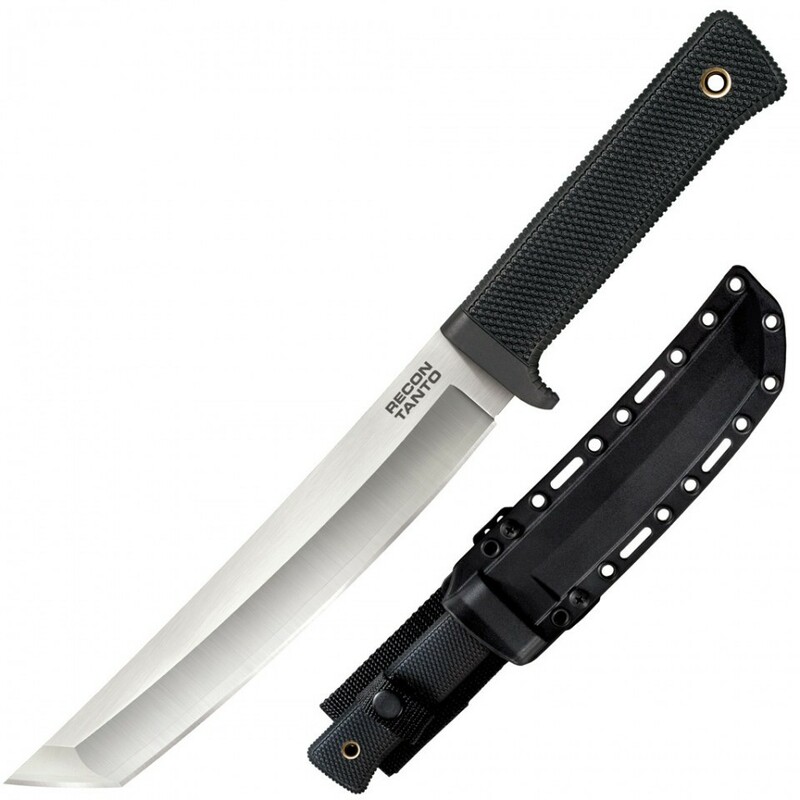 In addition, the Tanto’s come with our famous flattened oval Kraton® handle. The oval shape provides a solid grip and resists rolling or twisting in the hand under hard use, the kind that, over time, would destroy a lesser knife. The use of Kraton® in knife handles is another Cold Steel innovation. Kraton® is an unparalleled space age material that won’t crack or rot and is immune to the ravages of bad weather. The tapered, solid steel pommel is another important Tanto feature that should not be ignored. Lynn Thompson designed it to concentrate the full force of a crushing blow in a small area so that even a moderately powerful blow can be remarkably effective in disarming or otherwise incapacitating an attacker. The Tanto series knives in San Mai® all come with a thick, high quality Secure-Ex™ sheath that is sure to give years of hard service and keep your Tanto at your side, ready for action.